The Unrepresented Nations and Peoples Organization (UNPO), in collaboration with the Taiwan Foundation for Democracy (TFD), the Haella Foundation and Urmas Paet MEP (ALDE), will be convening a conference at the European Parliament entitled ‘Prospects for Minority and Indigenous Rights in South East Asia: Towards Regional Cooperation’. Drawing on the experiences of Taiwan in particular, the event will provide an overview of the current state of minority rights in South East Asia, as well as evaluate lessons learned from regional instruments such as the EU, the Council of Europe and OSCE. Despite South East Asia being a conglomerate of myriads of distinct ethnic, cultural, religious and linguistic groups, minorities and indigenous peoples remain the region’s most vulnerable communities. Often seen as a threat to social cohesion, members of these groups are routinely being denied their fundamental human rights, while left with little opportunity for redress. On top of that, many of the region’s governments deliberately exclude these populations from decision-making processes and fail to uphold their basic rights to food and health care. The economic situation of minority and indigenous groups is likewise critical, with their lands encroached by mining, logging, dam constructions and similar large-scale “development” projects. Concomitant mass displacements and the destruction of ancestral homelands further endanger the very existence of these groups. With regards to religious freedom, minority and indigenous groups are targets of systematic discrimination, often in the form of enforced religious assimilation. Despite some timid advances in recent decades to establish human rights mechanisms that would counter these worrying developments in the region, implementation and enforcement are still in their infancy. Against this background, this conference will raise awareness for issues associated with minority and indigenous rights in South East Asia, in particular by assessing recent developments and policies towards indigenous peoples in Taiwan, and comparing the path chosen by Taipei with other Asian cases, while keeping in mind the different European mechanisms dealing with the protection of minorities. The event will bring together expertise from academics, policy-makers, human rights activists, and representatives of various ethnic, religious and linguistic groups and indigenous communities in South East Asia. 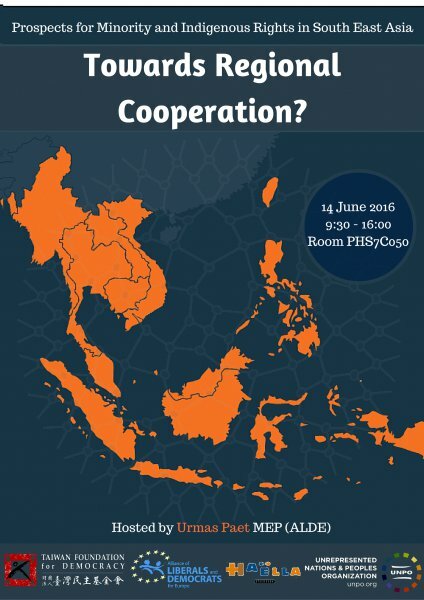 14:30 Panel III – Ideas from Europe and Ways Forward – Towards Regional Cooperation?